Triangles are so on trend. But in this case, we’re not talking about fashion or home decor, we’re talking about the newly constructed Triangle Building in Denver’s Union Station neighborhood. This modern marvel is quickly becoming the area’s newest hotspot. 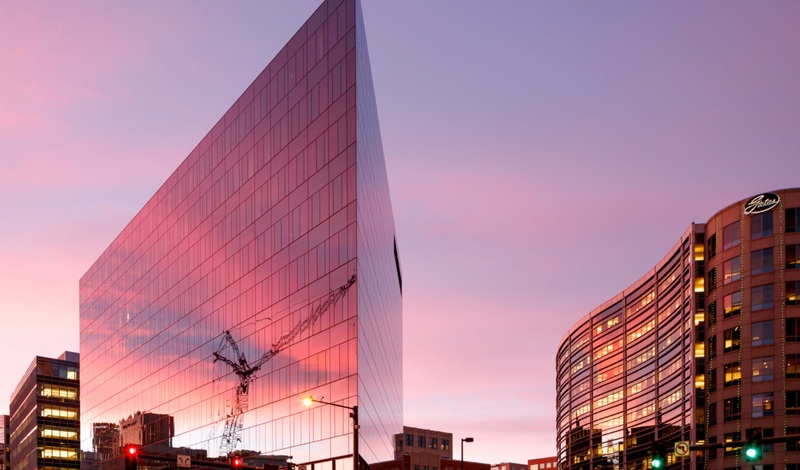 Westword Denver even named it the Best New Building in its annual “Best of Denver” issue. The Triangle Building’s prime location on the 16th Street Mall, its enormous size (320,000 square feet and 140 feet tall) and unique shape are only some of the qualities that make this recent development a big deal in the Mile High City. Local companies are quickly making this magnificent building their home, including WeWork and Liberty Global. One company has even committed to lease more than 20,000 square feet! Autodesk, a leader in 3D design, engineering and entertainment software, plans to move into The Triangle in late June. Stella’s on 16th will also be a part of this world-class space. The shop will offer cafe-style service, as well as an abundant selection of gourmet sandwiches, salads, soups and seasonally inspired dishes to enjoy in-house or to take home. Stella’s will also offer a unique selection of artisanal cheeses, charcuterie, freshly baked pastries, desserts and handcrafted culinary products from around the world. The shop offer about 150 seats for in-house dining. With roughly 45,000 square feet of space still up for grabs, we’re sure that this building will soon be a force to be reckoned with.